Does your security software do any of the following things? If your answer is yes (and I hope it is!) then your software is using up some amount of the system’s memory in order to keep you safe. Symantec’s mission is to make this protection impact as minimal as possible while still keeping you 100% protected. The more security software tries to catch things before they become a problem, the more impact they are going to have. 1) If more than 1 person is using a computer, create specific user log-in IDs. This will keep their preferences from adversely impacting you. 2) Avoid using too many start-up applications. The more applications the computer is trying to maintain and keep active, the slower the system will be. 3) Install only the applications that you need, and uninstall applications that you no longer use or want. Don’t just delete folders from the Program Files directory; go through the Add/Remove menu to remove unwanted programs. 4) Do not run more than one security application on the system at a time. The logic of ‘if one is good, two must be better’ does not work! Having more than one application trying to protect your system can lead to dramatic slow downs, decreased protection, and potential instability. Every single security vendor on the market is aware and warns against this situation. 5) Run the System Defrag and Clean Up tools to keep things from getting scattered or cluttered. The more scattered and cluttered the system is, the slower and chunkier it starts to act. 6) Where possible, try scheduling background processes for off-hours. For example, set your virus/spyware/malware scan or the Windows updater to run over-night, when you know the system is free. 7) If you’re still using a version of Norton older than 2008, you’re missing out on all the great performance and security gains we’ve introduced. What’s this mean for you? All the same great protection and peace of mind, but without the frustration of an unresponsive computer. Not only did we work to bring you reduced impact, but also increased protection by adding features such as Home Networking and Identity Safe. 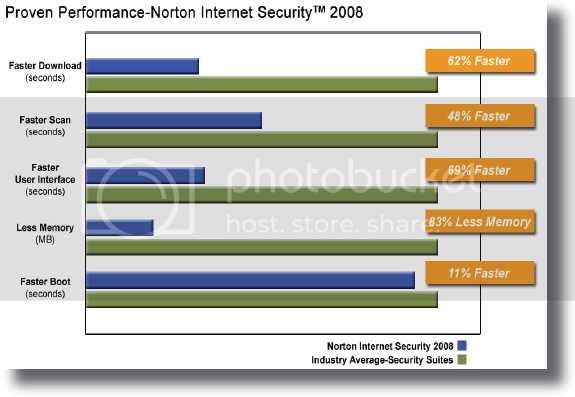 I’m proud to say that I believe Norton Internet Security 2008 is the best security suite product on the market … and I’ve looked at most all of them! As mentioned in the tips, if you’re running 2007 or older, you’re missing out. Update now. I hope these tips help you. You’ll be seeing a lot more updates from our team in upcoming releases so stay tuned!